The programme is intended to demonstrate the versatility of this new instrument, completed by Peter Bumstead in 2009. The case was designed by Rev Osmond Fisher for an organ in his parish in Dorchester with influences from Sir John Sutton. He moved it to Harlton in 1869 when it was used to house pipework by Bishop. The case now contains a Great organ using the Bishop soundboards and pipework to which has been added a choir manual using a soundboard and pipes from the previous organ in the neighbouring village of Haslingfield, a Flight & Robson swell organ and a pedal department using pipes from Haslingfield and a pedal reed from Little St Mary's in Cambridge. The result is a versatile instrument which Dr Chris Whitton, Fellow and Director of Music at Emmanuel College, Cambridge, demonstrates using some of the music played at the opening recital some little while before this recording was made. A sample from the end of track 7 can be previewed in a data compressed version by clicking here . Harlton CDs can be ordered directly from P H Music at the address shown below enclosing sterling cash, cheque (UK bank accounts only) or sterling postal order payment of £10.50 inclusive of post and packing. Export orders can be paid for similarly at £12.00. 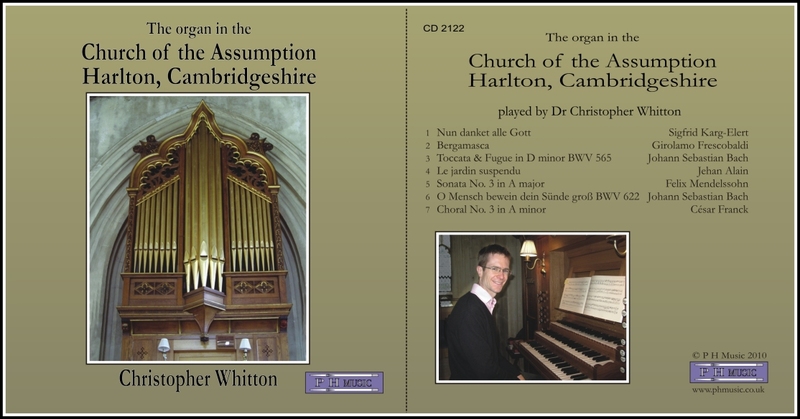 This CD was produced for The Harlton Organ Scholarships Trust. Purchases via the trust go to support the development and training of organists by offering organ scholarships to young people between 13 and 18 years wishing to develop their skills to the standard required for an organ scholarship at an Oxbridge College. Instead of posting a sterling cheque or postal order, secure payment can be made by credit or debit cards via PayPal by clicking below. The organ at Adlington Hall is arguably the most important surviving historic instrument in the British Isles and yet, its provenance is shrouded in mystery. No records survive to provide a definitive date let alone any to define its maker. No organ builder's records give any indication of work undertaken on the instrument either. It remained almost completely unknown until 1958, when Noel Mander was engaged to carry out a restoration of the organ. Amongst the interesting finds were a number of cut up playing cards used to pack the bearers on the soundboard. These were dated by de la Rue at around 1780, which is probably the date the instrument was last worked on. Noel Mander was able to revive all but a handful of the damaged pipes and very few were actually missing when a final tally was taken. The organ was returned to Adlington Hall in 1959 and heard for the first time for about 150 years. On this recording, Anne Page plays eighteen pieces, largely contemporaneous with the organ and is joined by Paul Binski for two 'pieces for two to play'. Handel visited the hall in 1741 and subsequently sent the Legh family who still own the hall a setting of a poem by Charles Legh, "The Hunting Song". The tune is included as track 17 on this disc and can be previewed in a data compressed version by clicking here . 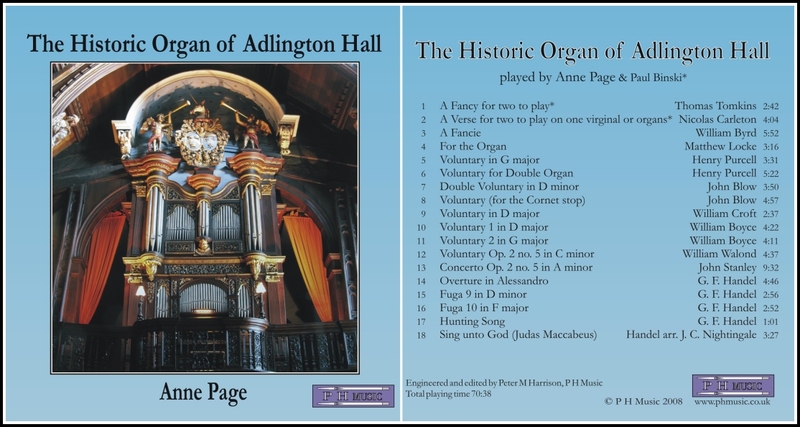 Adlington Hall CDs can be ordered directly from P H Music at the address shown below enclosing sterling cash, cheque (UK bank accounts only) or sterling postal order payment of £10.50 inclusive of post and packing. Export orders can be paid for similarly at £12.00. Alternatively secure payment can be made by credit or debit cards via PayPal by clicking below. Original pressed disc now out of stock. Orders will be fulfilled with full brochure artworks and burned CD-R.
Tomé Olives performs a variety of music demonstrating the full range of this remarkable instrument, one of only a handful of organs on this Mediterranean island in the Balearic group. Built in 1810 by Swiss born Johann Kyburz, it shows his North European origins, whilst also including very distinct Spanish influences. These are at their most blatant in the almost violent sound of the "en chamade" (horizontally mounted) trumpet used authentically in the performance of the "Marxa per Clarins" by Mestres and to give a unique edge to Sigfrid Karg Elert's "March Triomphale", Nun Danket Alle Gott. In the August 2001 edition of 'The Organ', the reviewer writes: "The sound of the instrument is stunning, from the gentle flute and flautado ranks, through the many mixtures and cornets to the sizzlingly glorious horizontal reeds on the Gran Organo. How brilliantly this has all been captured by the microphones, perfectly complemented by the warm acoustic". On this CD Tomé Olives demonstrates how effect this organ can be with some of the organ's core repertory including Bach, Couperin and Buxtehude and he concludes with one of his own pieces. Olives is organist of the Cathedral in Cuitadella in Menorca and also performs regularly at Santa Maria. Santa Maria CDs can be ordered directly from P H Music at the address shown below enclosing sterling cash, cheque (UK bank accounts only) or sterling postal order payment of £10.50 inclusive of post and packing. Export orders can be paid for similarly at £12.00. This disc was engineered, edited and produced by P H Music on behalf of the British Institute of Organ Studies (BIOS). For more information on the HOSA East Anglia disc and to place orders click on the disc image above which will take you to the BIOS web shop.